Okay, we've had a lot of down times around here and we seem to be getting into a bit of a funk. So we though that we'd put together a short list of Beatles songs closest and dearest to us. As those who have followed us for awhile, you are aware of the close connection we have to the music, as well as to the men themselves who sacrificed so much to create the legacy they've become. Our list is in no particular order. Just what songs came to mind when we were brain-storming and titles were shouted out. Enjoy, put your favorite Beatles album on as you read and feel free to add your own favorites to our list. 1) Blackbird - it wasn't until later in life that I understood the true meaning behind Paul's beautiful song. But to us, it has been a source of bonding and love that I cannot even explain. 2) Revolution - John absolutely rocks in this song. It always gets people up and dancing. Plus, the message behind the song is very powerful. 3) I Feel Fine - I think it's the guitar licks I enjoy most in this song. YAY GEORGE!! 4) A Day In the Life - longer than their usual songs but a powerful and moving message. Plus I love the all out orchestra instruments. 5) Hey Jude - Paul wrote this song for Julien, offering his support in his own way, when John and Yoko got together. If you listen to the words, though, you can most likely add one of your own situations in there. 6) Helter Skelter - Yes, a very disturbing association to this song is the Charles Manson chaos. No, the Beatles were not speaking to the freakazoid, inspiring him to kill people. I try to tune that association out while listening to it because this has to be one of their best songs if for no other reason than you can actually hear each of them singing as well as each of their instruments. Well...maybe that's just me. 7) Tomorrow Never Knows - Okay, yes. It's funky and, yes, they may have been a bit...happier than usual while recording it but it is stunning to know that they created a new way to record music for that time. Great tune. 8) Come Together - You don't have to be a die-hard Beatles fan like me to love this song. 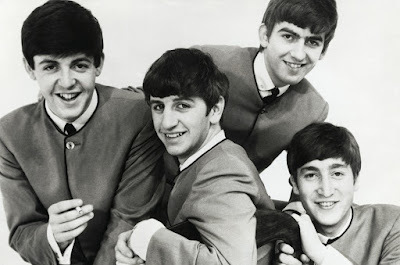 I always waffled between Ringo and John when I was young. Ringo was cute and hilarious and John was sarcastically witty and wonderful with lyrics. 9) Something - I literally cry every time I hear this song. Between George's gentle singing voice and his tremendous guitar talent, plus the meaning behind this beautiful song, all just ping my heart. 10) In My Life - I've carried this song with me all of my life, along with Blackbird. It calms me, makes me think about goodness surrounding me so the bad melts away and, if I'm in the right mood, allows me to release any tears I usually don't let fall.